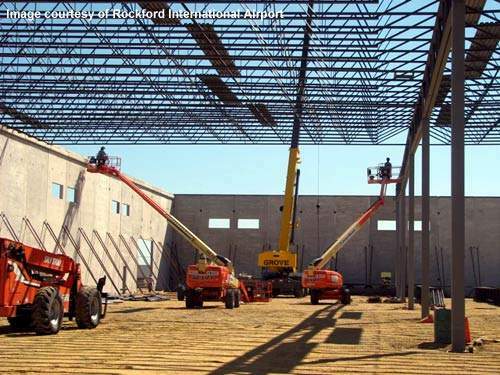 The new international cargo centre at Rockford Airport is expected to bring &#36;100m into the local economy. The 72,000ft&sup2; building is the first phase of the Tandem project at Rockford International. Rockford's new international jet bridge was completed in December 2007. The passenger terminal has been improved since 2004 when Rockford Airport first achieved international status. 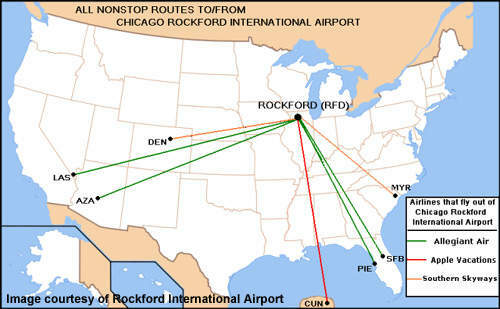 The passenger routes run from Rockford International Airport at the current time. 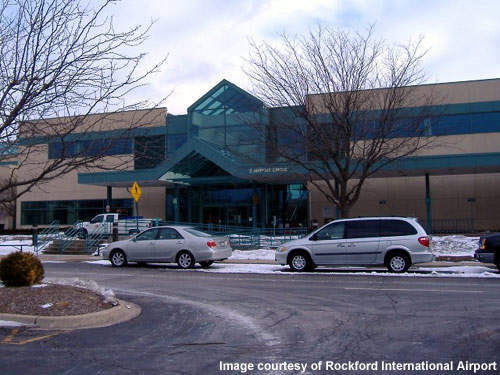 Rockford International Airport (RIA) or as it sometimes called Greater Rockford Airport is situated around 68 miles northwest of the City of Chicago and just four miles south of Rockford in Winnebago County on a site of 2,900 acres (1,174ha). The airport is a general aviation and cargo airport that conducts around 77,558 operations a year (212 a day) and in 2007 played host to 215,000 passengers. The controlling authority for the airport is Greater Rockford Airport Authority which owns, manages and operates as well as funds the airport. RIA has had international status since 2004 and since that time has been in competition with Midway and O'Hare for the passengers in its catchment area (but Rockford does have free car parking). Rockford has two long runways that are ideal for hosting cargo planes (even the Russian Antonov AN-225 can land). These are 1/19 which measures 8,199ft×150ft (2,499m×46m) and 7/25 10,004ft×150ft (3,049m×46m); both are equipped with a category II/III instrument landing system. The airport has operations which breakdown into 72% general aviation, 18% scheduled commercial flights, 6% air taxi and 3% military operations. RIA is currently the 224th largest passenger airport in the world but the 19th fastest growing. Cargo is a large part of the business at the airport, which has two cargo aprons. The northern cargo apron is used by UPS as their main facility in this region and is next to the passenger terminal. In 2006 the airport added a 70,000ft² package and heavy freight facility and a 550,000ft² sorting facility that receive 22 flights a night. It also lengthened the runway to 10,000ft for larger cargo aircraft. The southern cargo apron situated between the two runways is used by BAX Global and DHL cargo for their operations. RIA is the 22nd largest air cargo airport in the US and for United Parcel Service hosts their third largest cargo sorting operation. RIA has a modern two-storey terminal building with three jet bridges for regional jet operations handling aircraft as large as the Boeing 767 (United Airlines runs a service to Denver). The airport is capable of landing and launching any aircraft in the world capable of non-stop flying to Europe, Africa, Asia and South America. The terminal has one international arrival jet bridge which was completed in December 2007 by Larson and Darby Group. Between 2005 and 2007 a number of small enhancements were made at the airport terminal to bring it to the standard required to handle larger passenger volumes. These projects, which cost $183m (bond for the finance was paid off in January 2007) included: parking expansion to 1,750 spaces (addition of 460), beltline road expansion, hangar development, snow-removal equipment building, addition of international arrival gate and jet bridge, and a new fire station. The terminal building itself received expanded arrivals and departures areas, two new passenger loading bridges, two new escalators, new baggage carousel (obtained in 2005 from Ottawa International Airport), new viewing area and a new customer information area. 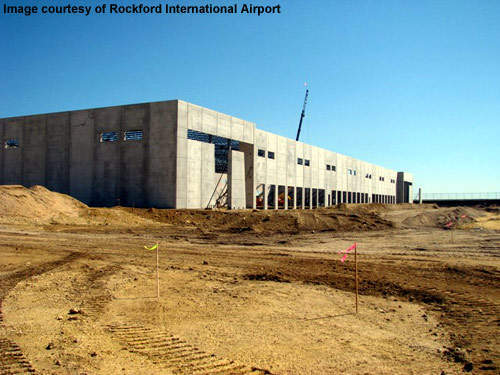 Work began in August 2008 on an international cargo centre and business expansion at Rockford International. The central building will be a 72,000ft² structure with runway access which is expected to be taken up by a major airfreight company looking for a cheaper way to export goods into the US Midwest (20 truck docks with 16ft×20ft size). The build out for the new project could eventually be up to 500,000ft² over 30 acres and will form an important part of the airport's foreign trade zone (FTZ). The project is being developed by Tandem Development Group and is expected to, when completed, bring $100m into the local economy. The initial investment for the project will be $20m although the airport itself will pay for the ramp area and other plane handling infrastructure for which it will raise a bond of $8m. The decision was taken early on not to build one large building but smaller units with access in between for planes and vehicles.